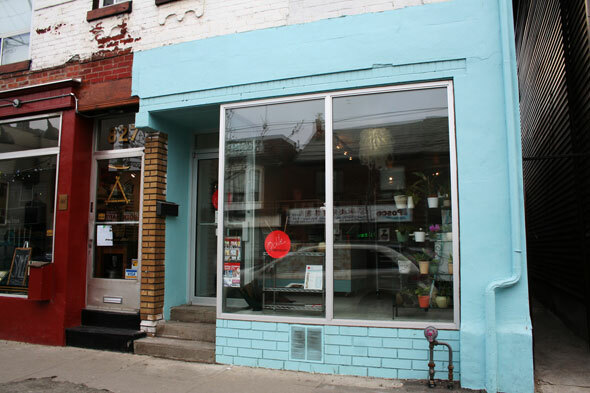 Odile Chocolat's bright turquoise exterior sits on a quiet strip on Dundas West , just west of Bathurst St.. Behind a glass case lies rows of chocolate truffles wrapped in crinkly cello bags, reminiscent of a department store's jewelry counter. Labels announce the name of the truffle on each package, and flavour combinations range from vodka and candied grapefruit peel (the "Sea Breeze"), to sake and Japanese green tea (the "Chiyo"). For my visit I bring along my friend and chocolate lover, Nicole, and we pick out three enticing flavours for an indulgent lunch, including their most popular seller, the "Romance:" champagne, black pepper and rose petal. 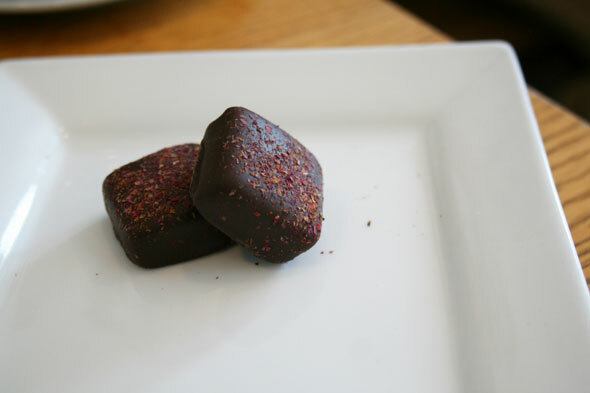 Each package, at $4.50, contains two to three truffles each. Odile's menu also includes candied fruit covered in chocolate and an assortment of gift boxes. I'm pleased to hear that owner Odile Chatelain makes all of her chocolates right at the Dundas West store. As well as catering to the city's holiday crowd, her products are also available at specialty grocers like The Mercantile , The Healthy Butcher , Thobors and La Fromagerie . Odile reveals that since her business started over five years ago, customers have shifted their focus, and she, as well as other food producers, must be more accountable as to where their ingredients come from. She sources organic, wild and natural ingredients whenever possible and utilizes fair trade cocoa. 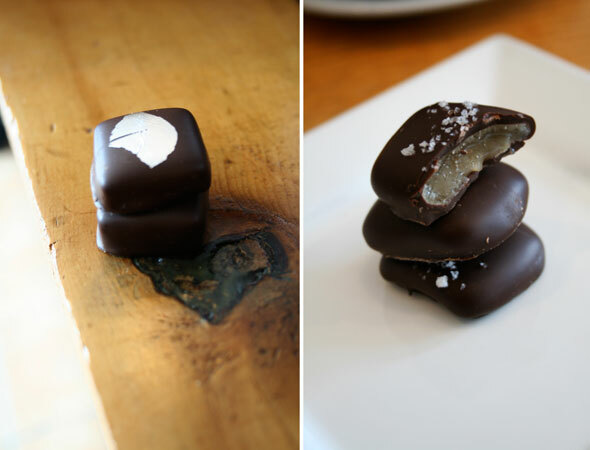 Along with the "Romance," we opt for the fleur de sel caramel, and cardamom and silver leaf, affectionately named the "Bollywood." Odile also treats us to her newest creation: raspberry vinegar. Unfortunately Odile Chocolat doesn't have seating for us to enjoy our fare, so Nicole and I skip down the road to Ezra's Pound for lattes to wash down our treats. Each individual truffle, upon closer examination, is beautifully dressed. The "Romance" has bright pink flecks on top of its smooth, matte surface. The bite of black pepper is most prominent, and the flavour lingers long after the square has been devoured. The sea salt and caramel is the most surprising: big flakes of sea salt hit my palette right away before revealing a soft caramel centre. The cardamom and silver leaf is hands-down my favourite - its flavours aromatic and subtle. Odile Chocolat is easy to miss, but it's worth a visit. And Odile is right behind the counter, happy to talk about her great product and answer questions about her morsels of art.